"TAR20 Casino Game - Wk8 Entry - Wk7 Results" - Reality TV World Message Board Forums - "TAR20 Casino Game - Wk8 Entry - Wk7 Results"
"TAR20 Casino Game - Wk8 Entry - Wk7 Results"
That was a really weird leg design. The two Detour options seemed shockingly easy, with the jumping one potentially completed in 60 seconds, while the other one didn't look like it could take hours or anything. But the Roadblock was genuinely difficult, causing a rare instance of all of the remaining teams ending up at the final challenge together. Reminds me a lot of building that T-Rex during the Second Chances season. Can't think of that many other legs where one challenge dominated so heavily. The Perfect Bet Award is tie between IanQuentin and jbenz at 2.03x. They verrrrry narrowly edged out KwietOne (2.01x), michel (2x), bbenzenberg (1.99x), and CTgirl (1.97x). A lot of great scores this week! Congratulations! This week's Greatest Gainer Award goes to CTgirl who climbed 5 ranks to join the Top 10 this week. Not too much shuffling overall with the myriad of Art/J.J. bets, but still a very nice accomplishment! Way to go! It's weird how much Art & J.J. dominated the betting this week, even though Rachel & Dave have notched a bunch of wins already. Sure, they racked up a lot of the leftover/secondary bets, but very few people chose them as their #1. Another missed opportunity was the bonus game, which was a real stinker. Every player who attempted it missed out, which is rough considering the bonus multiplier this week. Don't worry, you'll get a second chance. Some shuffling around toward the top, with IanQuentin seizing the lead by putting his bonus multiplier to good use. jbenz made a huge leap as well, though, so it's certainly a very close race. Especially with the dare bonuses, it feels like anything could happen. And now it's time for the payout table, which is used for determining your... Wait a minute. What? Well, this is kind of weird. I Dare You! I dare you to skip the regular wager this week, and only play in the bonus game! Don't worry, you weren't going to get that 2x anyway! Huh, same payout table as last week. Strange. Ah, don't get your eyes checked, because your vision is fine. We're playing Lucky 7 again! Exact same rules as last time, so check last week's thread for the rules. As you can see, this week is exactly the same as last week, except the dare is inverted. People overwhelmingly voted to accept the dare to skip the bonus game, so let's see if the reverse is true! Except, since the bonus game is technically a riskier venture than a straight bet, you'll get a 1.6x bonus next week instead of the 1.3x offered last week. Accepting the dare may cause you to have to bank a whole bunch of points, but you still got a shot at hitting a +320 on the bonus game alone this week. And you'd have a whopping 1.6x bonus for next week, which is a huge advantage down the road. Choices, choices. When coming up with the dare last week, I wondered to myself, "Does blocking the bonus game create a game balance problem?" I'm still not sure what the game theory answer is, but this is me swinging back in the opposite direction. 1. "RE: TAR20 Casino Game - Wk8 Entry - Wk7 Results"
2. "RE: TAR20 Casino Game - Wk8 Entry - Wk7 Results"
3. "RE: TAR20 Casino Game - Wk8 Entry - Wk7 Results"
4. "RE: TAR20 Casino Game - Wk8 Entry - Wk7 Results"
5th from the top! Whoop-Whoop! Where are Voice of the Beehive when we need them? 5. "RE: TAR20 Casino Game - Wk8 Entry - Wk7 Results"
6. "RE: TAR20 Casino Game - Wk8 Entry - Wk7 Results"
7. "RE: TAR20 Casino Game - Wk8 Entry - Wk7 Results"
8. "RE: TAR20 Casino Game - Wk8 Entry - Wk7 Results"
9. 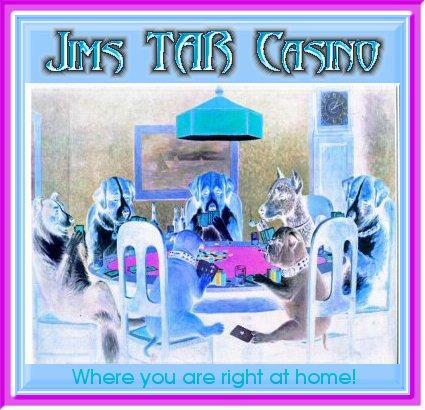 "RE: TAR20 Casino Game - Wk8 Entry - Wk7 Results"
42 Jims on Bopper/Mark and Nary/Jaime to hit the magic seven. Rest on account, please Pat. 10. "RE: TAR20 Casino Game - Wk8 Entry - Wk7 Results"
11. "RE: TAR20 Casino Game - Wk8 Entry - Wk7 Results"
12. "RE: TAR20 Casino Game - Wk8 Entry - Wk7 Results"
13. "RE: TAR20 Casino Game - Wk8 Entry - Wk7 Results"
14. "RE: TAR20 Casino Game - Wk8 Entry - Wk7 Results"
15. "RE: TAR20 Casino Game - Wk8 Entry - Wk7 Results"
16. "RE: TAR20 Casino Game - Wk8 Entry - Wk7 Results"
This week's dare is nuts. No way! 17. "RE: TAR20 Casino Game - Wk8 Entry - Wk7 Results"
This looks like a good week to go out, so I'll take the dare and an Art/J.J + Rachel/Dave combo for 16 points. So much for my one and only non-strategy. 18. "RE: TAR20 Casino Game - Wk8 Entry - Wk7 Results"
19. "RE: TAR20 Casino Game - Wk8 Entry - Wk7 Results"
20. "RE: TAR20 Casino Game - Wk8 Entry - Wk7 Results"
21. "RE: TAR20 Casino Game - Wk8 Entry - Wk7 Results"
22. "RE: TAR20 Casino Game - Wk8 Entry - Wk7 Results"
23. "RE: TAR20 Casino Game - Wk8 Entry - Wk7 Results"
24. "RE: TAR20 Casino Game - Wk8 Entry - Wk7 Results"
25. "RE: TAR20 Casino Game - Wk8 Entry - Wk7 Results"
This is really tricky for me this week, not having a bonus this week, and everyone above me having one. I feel like if I'm going to be taking a drubbing this week either way, so I'm thinking about just writing this week off and taking the 1.6x for next week. So, I guess I'll try it? If I miss the bonus and go back to 500 that's really going to hurt, though. Here's hoping for a powered-up 900 next week. 26. "RE: TAR20 Casino Game - Wk8 Entry - Wk7 Results"
27. "RE: TAR20 Casino Game - Wk8 Entry - Wk7 Results"
28. "RE: TAR20 Casino Game - Wk8 Entry - Wk7 Results"
29. "RE: TAR20 Casino Game - Wk8 Entry - Wk7 Results"
So confused . . .
Lucky 7 Bonus: Art/JJ & Mark/Bopper - 80 points.